Parthenocissus quinquefolia with flower buds. M. Gargiullo (ca. 2005). 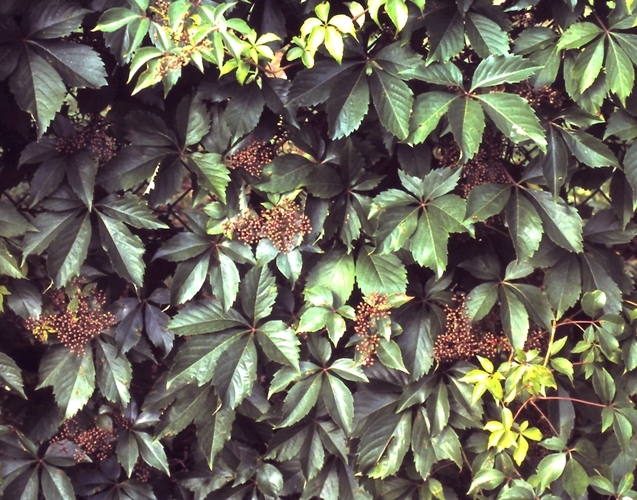 Parthenocissus quinquefolia is a woody vine, bark gray, rough, with conspicuous warty lenticels; tendrils opposite leaves, much-branched, branches disk tipped for adhering to bark or other surfaces. Leaves alternate, long-stalked, blade palmately compound, leaflets 5, stalks none to 1.5 cm long, blades, 6-12 cm long, elliptic to widest above middle, tip pointed, base wedge-shaped, dull green above, paler below, margin sharply toothed above middle; leaves appear as forest canopy closes, adapted to both shade and open habitats, often a ground cover in closed canopy where light saturated photosynthetic rates are much lower than that of leaves in full sun (Taylor and Pearcy 1976); leaves live up to 25 weeks (Hicks and Chabot 1985). Flowers dull white, tiny, 5-parted; inflorescence branched, longer than wide, with a central axis; axis zigzagged, flowers in umbrella-shaped clusters at ends of branches; June-July. 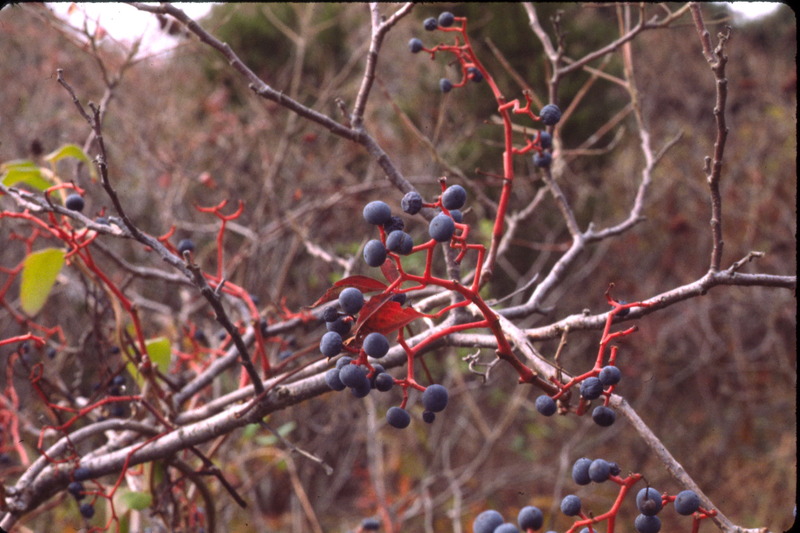 Fruit fleshy, dark blue with bloom, 0.6 cm, fruit stems often red, Sept.-Oct. Persistent into winter; 1-4 seeded. Seed load 30%. Pulp nutrients: water 73%, lipid 16%, protein 8%, CHO 19% (White 1989). Fruit eaten, seeds dispersed, by songbirds & mammals, including raccoons and skunks (Wilson 1993). 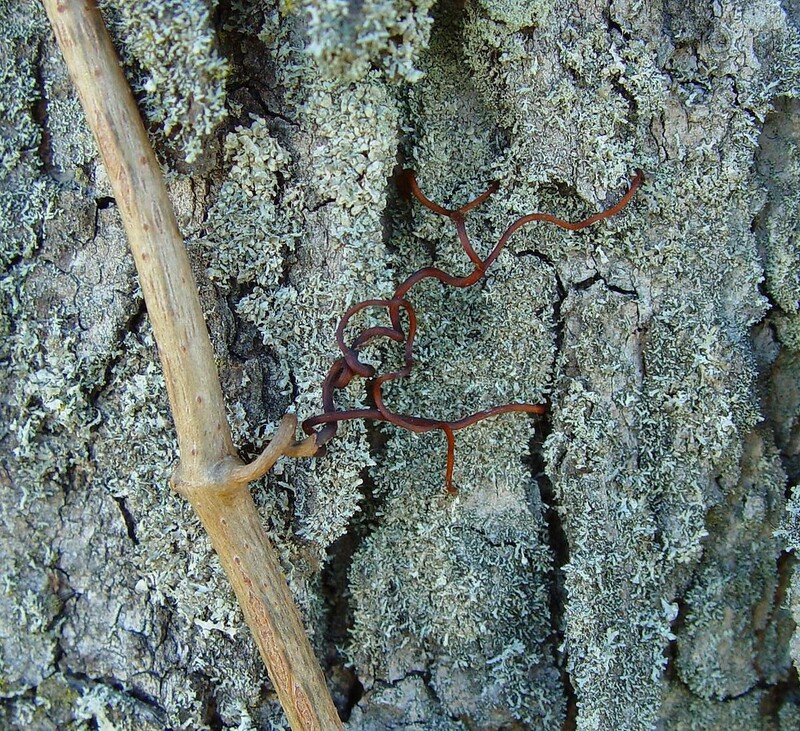 Parthenocissus quinquefolia.tendril.Arthur Haines.New England Wild Flower Society.montshire.newenglandwild.org (Accessed 5/2014). Habitat: Moist to dry soil in open and disturbed areas, woodlands, vinelands, also found on sandy soil of back dune shrublands. Very shade tolerant, often a ground cover in woodlands. Tolerates soil pH 3.8-7.5 (Greller et al. 1990; Hightshoe 1988). In NYC found in soils with pH 4.8-7.0 (Gargiullo unpublished data). Notes: Foliage eaten by rabbits (Martin et al. 1951). 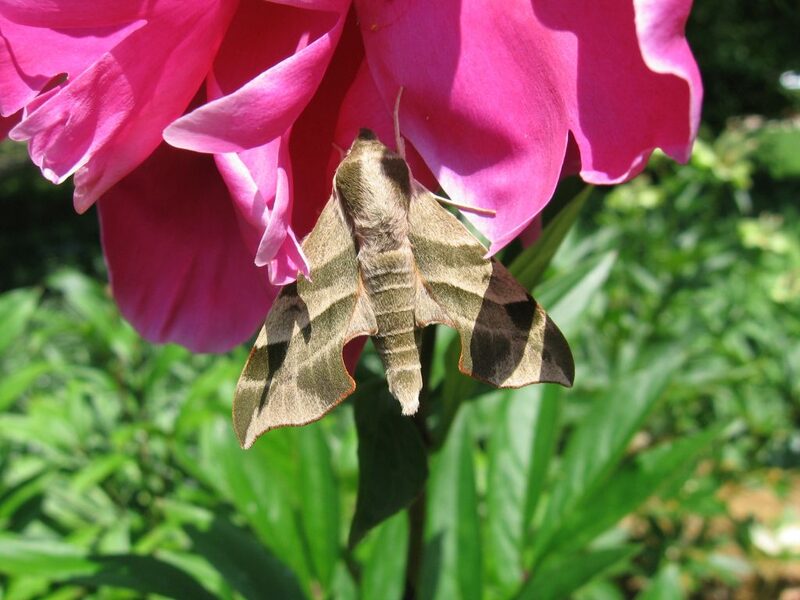 Used by Darapsa myron (Virginia creeper sphinx moth) larva. Dispersal to and establishment in new sites in successional forest, contiguous to old regrowth stands has been calculated at a rate of 1.82 m/yr (Matlack 1994).